Due to this week's winter storm, there is the possibility of snowfall in San Diego County Mountain areas including Julian, Pine Valley and Descanso. 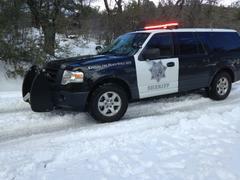 For those planning to head out to the mountains, the Sheriff's Department wants to remind you to be prepared. Be sure to check road conditions before heading out. Have a full tank of gas, water and food supplies in case you are stranded in traffic. Have snow chains for areas where they may be required. Public restroom facilities are limited. Be mindful of areas that are private property which are marked by signs and fences. Private property is off limits to the public for recreational snow activities. Parking is limited. Parking violations will be enforced and citations will be issued. Vehicles blocking roadways and private property will be towed. Be aware of increased law enforcement activity to handle the large crowds. Be aware of increased law enforcement activity to handle possible crowds.